My name is Wayne and this website is about my experience rebuilding a Fender Deluxe Reverb tube amplifier. I started out with a Deluxe Reverb Reissue (DRRI) and ended up with a reborn, boutique amp. Casting aside the printed circuit board and stock transformers, MikeyMann Amplification breathed new life into this amp with thoughtful improvements to enhance the sound and serviceability. 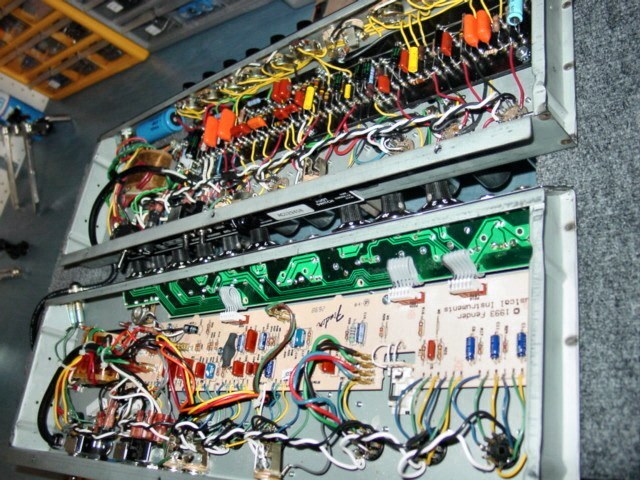 I’ve written the following account in chronological order so you can share my sense of discovery of the intricacies of this amp rebuild and the commensurate enhancement of my tube amp electronics knowledge. Since tube amps are a major hobby of mine, I’m always glad to gain new tube amp knowledge and this experience has been a true pleasure in this regard. I hope you enjoy the journey through the rebuilding of this tube amplifier as much as I enjoyed writing it. From one tube ampoholic to another . . . .
Stock DRRI (bottom) and rebuild (top) shows the change from printed circuit board to handwired construction. Not only does it look better, it sounds much better.